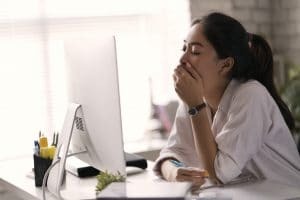 Is My Daily Fatigue A Symptom Of Sleep Apnea? Your daily schedule can feel that much more daunting when you are experiencing the effects of fatigue. If you find yourself struggling to stay alert frequently, even on nights where you believe you had restful sleep, this could be a symptom of sleep apnea. While sleep apnea is often linked with snoring, there are other issues related to the condition that should concern you, including real health risks. Fortunately, your Shrewsbury, MA dentist can help you deal with sleep apnea. Instead of relying on a CPAP machine, you may be able to treat your problem with the use of a special oral appliance. By responding to possible sleep apnea, you can regain your rest, and feel the positive effects of a good night’s sleep! If you are experiencing sleep apnea and not addressing it, you can experience several issues. Snoring is common, and fatigue during the day can be a frequent concern. You can also experience problems if you have existing issues like diabetes, or mental health issues. Because sleep apnea can negatively impact your blood pressure, an untreated case can increase your risk for experiencing heart disease. During your next routine dental checkup, you can bring up your struggles with poor sleep. Of course, if you already feel that something may be wrong, you can set up an appointment to discuss this concern. Instead of having you rely on a CPAP machine, your dentist can create a custom oral appliance you can wear when you sleep. Once inserted, this appliance can keep your airways open, which can give you the ability to rest through the night without obstructed breathing. This combats the effects of obstructive sleep apnea, a form of sleep apnea where your soft tissues are blocking your breathing passages. If you want to find a solution to sleep apnea that does not involve a CPAP machine, talk to Modern Dentistry of Shrewsbury! Our practice can help you address this worrying condition, and give you the support you need to regain your ability to enjoy the benefits of rest. Contact us to schedule an appointment with Dr. Pizzi, Dr. Mehdi, and colleagues by calling our office at (508) 842-8838. Located in Shrewsbury, MA, we proudly take care of patients from Worcester, North and South Grafton, Westborough, Southborough, Northborough, Boylston, Hopkinton, Millbury, and all other nearby communities.